Hardly a stranger to edgy advertisements, Italian clothing company Benetton continues its penchant for controversy with a new campaign that features images of various political and religious world leaders kissing. The company’s “Unhate” campaign launched Wednesday, with a mission to combat hatred and “contribute to the creation of a new culture of tolerance.” The Photoshopped images are racy by nature of its pairings, pitting leaders against their supposed political foes. Israeli Prime Minister Benjamin Netanyahu locks lips with Palestinian President Mahmoud Abbas, while President Obama gets up close and personal with Venezuelan President Hugo Chavez, among other pairings. 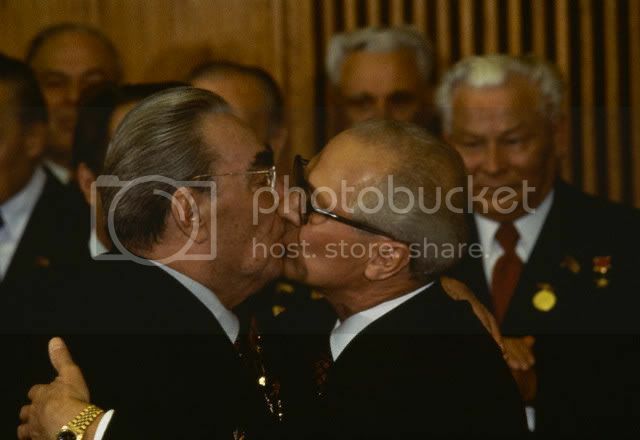 The Washington Post reports that the ads are inspired by this kiss between Soviet leader Leonid Brezhnev and East German communist leader Erich Honecker in 1979. The company's advertisements have always pushed the envelope, but the fashion house hasn’t come out with a campaign of this nature in a long time. The WSJ and the Washington Post both seem skeptical about whether its mission is in earnest, or rather just a last-ditch attempt to resurrect the brand. Either way, people are talking.